Nutmeg the spice is the seed found in the fruit of the same name. It is found on evergreen trees of the scientific family of Myristicaceae. The most commercially grown tree is the Myristica fragrans, a native of the Spice Islands of Indonesia. The tree offers another spice too called mace. This is the outer, reddish covering of the seed. The common nutmeg has a mildly sweet flavour and is used as a condiment in a powdered form in many cuisines. Nutmeg oil a good pain reliever and can alleviate arthritic pains and aches as well as muscle strains, etc. Its consumption can also help relieve pain because it acts as a sedative. A pinch of nutmeg powder in a glass of milk will soothe those suffering from insomnia. Myristicin found in nutmeg has been found to inhibit an enzyme that plays a role in the appearance of Alzheimer’s disease. It helps in boosting memory too. But when taken in high doses, it can have hallucinogenic effects. Nutmeg has antibacterial properties that can get rid of bad breathe and protect your teeth and gums. The oil is effective in treating toothaches. Eugenol in nutmeg is beneficial for the heart. Stomach problems such as indigestion, diarrhoea, bloating, etc, can be reduced by adding nutmeg to your food or taking a decoction of nutmeg mixed with honey. A paste of nutmeg powder mixed with honey can be applied on the face to reduce blemishes and improve skin texture. Nutmeg can be used to detox your liver and kidneys. The nutmeg has a host of nutrients, and its antioxidant properties help build immunity and keep disease away. It has been used as an aphrodisiac. The potassium content in nutmeg helps control blood pressure and circulation. 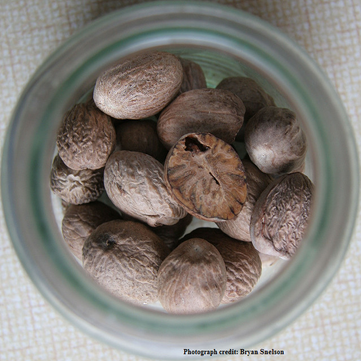 Some studies show that nutmeg may be able to fight leukaemia cells. Caution: Eating 1-3 whole nutmegs can cause adverse reactions such as palpitations, nausea, dizziness, hallucinations, etc. Excessive amounts of nutmeg can also cause death. A pinch or two of nutmeg powder is considered safe. Pregnant and lactating women should avoid nutmeg for medicinal use. Ingredients: 3 large potatoes, ½ tsp of mustard seeds, ½ tsp of cumin seeds, 8 curry leaves, two medium size onions, two green chilies, 1 ½ tsp of ginger-garlic paste, ½ tsp of red chili powder, ½ tsp of turmeric powder, 2 tbsp of oil, and salt to taste. Preparation: Peel and parboil the potatoes for about 20 minutes on a medium to low flame. When parboiling, keep the lid on the utensil. This helps the cooking process take place faster and more evenly. Separately, let the mustard seeds pop in the heated oil and then add curry leaves, the cumin seeds and chopped onion. Sauté the onion till it is translucent. Add the ginger-garlic paste, chili powder, turmeric and green chilies. The green chilies can be chopped finely or, if you want to avoid the heat of the chilies keep them whole with a small slit in them. Stir these ingredients around for 5 minutes and then add the chopped, parboiled potatoes. Add salt and mix well. Cook for 15-20 minutes before serving. Ingredients: 200 gm of moong dal, 1 medium size onion, two green chilies, 1½ tsp of ginger-garlic paste, ¼ tsp of red chili powder, ½ tsp of turmeric powder, ½ tsp of mustard seeds, ¼ tsp of cumin seeds, 7-8 curry leaves, two medium size tomatoes, salt to taste and 2 tbsp of oil. Preparation: Boil the moong dal on a low flame till it softens (15-20 minutes). Separately, add mustard seeds to heated oil in a saucepan and let them pop. Then add the cumin seeds, curry leaves, slit green chilies and chopped onion. Cook till onion becomes translucent. Add the ginger-garlic paste, red chili powder and turmeric powder. Cook for a few seconds and add chopped tomatoes. Add boiled moong dal and cook for 15 minutes. Apply a mixture of oatmeal and water/milk on your face which will sooth the acne prone areas. Let it remain on for about 20 minutes and then wash it off. Oatmeal can also be used to exfoliate your skin by rubbing the mixture in circular motions on your face. This will help clean your skin, especially if it is sensitive, and avoid clogged pores which lead to acne. A mixture of two tablespoons of honey and one teaspoon of cinnamon powder applied to the face, or only on the acne, can work wonders. Honey has antibiotic properties to fight infection and cinnamon’s antibacterial properties fight the bacteria that lead to acne.